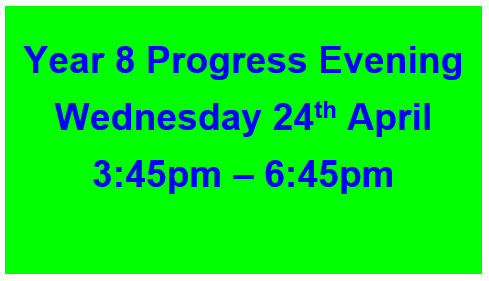 Click here for more details……..
On Wednesday 24th April, we are holding our Year 8 Progress Evening between 3:45pm and 6:45pm. Please could you put this date in your diary and ensure that you check your son or daughter’s planner to make sure they have made appointments with their teachers. If you cannot attend for any reason, can you please inform Mrs Rowland.